Selecting rings can be a fun, or it can be a difficult adventure in itself. 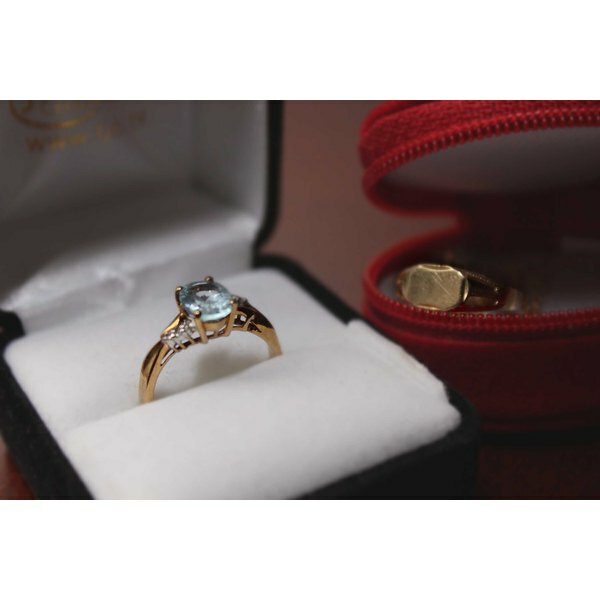 Knowing the size of the finger for which you are purchasing the ring is a very important aspect in the process. Jewelers have special sizing tools for this, but you can also learn how to determine the measurement in the comfort of your own home. You only need a few small household items to determine the ring size you are after. Cut a piece of string 2 to 3 inches long. You can use any type of string as long as it lies flat and is bendable. Wrap the string around the base of the finger you are sizing. Pinch the string with the thumb and forefinger of your other hand at the point that the string starts to intersect. Slide the string up and down to make sure it goes over the knuckle with ease and doesn’t get stuck. Take the measurement at the end of the day when fingers are their largest size. Make sure your fingers are not cold; if they are, it will result in skin shrinkage and will give you an incorrect measurement. Mark the string with a permanent marker where the string makes one complete circle. Marking accurately is important, since the sizing is done in millimeters and just the smallest mistake can result in the wrong size calculation. Measure the marked length of string and consult the ring-sizing chart for the size. According to Diamonds.com, the sizing is as follows: 44.1 mm (Size 3), 45.4 mm (Size 3.5), 46.5 mm (Size 4), 47.8 mm (Size 4.5), 49 mm (Size 5), 50.3 mm (Size 5.5), 51.5mm (Size 6), 52.8 mm (Size 6.5), 54 mm (Size 7), 55.3 mm (Size 7.5), 56.6 mm (Size 8), 57.8 mm (Size 8.5), 59.1mm (Size 9), 60.3 mm (Size 9.5), 61.6 mm (Size 10), 62.8 mm (Size 10.5), 64.1 mm (Size 11), 65.3 mm (Size 11.5), 66.6 mm (Size 12), 67.9 mm (Size 12.5), 69.1 mm (Size 13). If your exact measurement is not shown, always go up to the next size to ensure comfort.